A visit to the Let340B.org website, paid for by the AIDS Health Foundation in California, finds patient stories and the office phone numbers of lawmakers on the Senate Health, Education, Labor and Pensions Committee, where serious talks over whether the program needs an overhaul started a few months ago. However substantial movement on viable solutions for fixing the beleaguered 340B program, which was designed by Congress in 1992 to help the poor, has largely been thwarted by an escalating lobbying war between entrenched parts of the healthcare industry. It's hospitals vs. Big Pharma, with groups like the AIDS Health Foundation—led by vocal pharma critic Michael Weinstein—adding their voices to the mix. While hospitals and drugmakers have been at odds over the program's scope and reach for years, the war intensified late last year when the Trump administration proposed an across-the-board cut to Medicare Part B payments. That cut went into effect in January. Since then, legal and political setbacks have piled up for hospitals in each of the three branches of government. And it remains unclear whether their hard-line stance against any negotiation—which they say would inevitably lead to cuts to the program—will work in the long term on Capitol Hill. In the Senate, especially, the strategy has helped check lawmakers. Although the Senate health committee held two hearings in the past several months to explore whether Congress should write 340B regulation into law, Chairman Lamar Alexander (R-Tenn.) has declined to speculate when or if the panel will produce any new policies. Senate aides close to talks blamed hospitals for the hesitation, noting that the lobbying pressure on lawmakers is hampering any real chance for new action in the upper chamber. In the House, though, lawmakers have pushed through the blockade. After months of backroom talks, the Energy and Commerce Committee earlier this month held a hearing on a packet of bills, several of which would drastically reduce 340B income for certain hospitals. These measures included a bill to tie the discount to a hospital's uninsured patients (with a carve-out for certain providers like rural, critical-access and vulnerable disproportionate-share hospitals); a bill to beef up auditing requirements; and even a potential mandate for some 340B providers to pass on all savings from the discounts to their low-income patients. One hospital lobbyist likened these bills as a way to get hospitals to the table by serving them up on the menu. Rep. Chris Collins (R-N.Y.), a longtime proponent for 340B overhaul, said he is seeing a slight change in how hospitals are approaching talks. “I think they realize something's coming, and you'll either be at the table or not,” he told Modern Healthcare last week. Meanwhile, both chambers are working against a backdrop of two major complicating factors: the upcoming midterm elections and the stalemate over the hospital lawsuit against HHS to block the Medicare Part B cuts. Big Pharma lobbyists are hoping that more lawmakers will come on board with program changes once the midterms are over. Hospital lobbyists also say the conversation could change depending on how Congress looks post-election. Meanwhile, hospitals continue to fight the HHS cuts in the courts. They suffered a setback on July 17 when a federal appellate court dismissed the complaint on technical grounds. Since there was no ruling on the merits of the case, industry groups, led by the American Hospital Association, will refile the lawsuit in hopes of getting a binding decision by the end of this year. But the delay in a substantive ruling adds to the 340B gridlock because a resolution would substantially change the hospitals' stakes and leverage in any legislative negotiations. Through all these complications, hospitals are defending their strategy—arguing that Congress is essentially calling them to the table to concede benefits that Congress created to begin with. Congress also created the expansion that some lawmakers now say created too wide of an opening to qualify for the drugmaker discount. The latest expansion to rural, critical access, free-standing cancer hospitals and children's hospitals was approved with the ACA. Legislative aides who are part of the overhaul effort say the hospitals are offering them nothing substantial in negotiations. The providers have said any transparency requirements should be matched with transparency requirements for the drugmakers, but the aides say this is a false equivalency because manufacturers are only required to provide the discount, whereas hospitals are the ones responsible for spending the substantial savings. Still, Rep. David McKinley (R-W.Va.), who has emerged as a champion for hospitals among the House Energy and Commerce GOP, thinks compromise is possible even if it has to wait until after the election. McKinley introduced a bill to forestall the Medicare Part B cuts in December 2017 and secured more than 200 co-sponsors from both parties. Stopping the cuts remains his top priority should hospitals lose in the courts. He said the West Virginia University hospital system in his district will lose $10 million this year alone from the cuts. But he also wants all sides to get together and work out a compromise because otherwise the conflict will only worsen. McKinley is optimistic: “I don't know on what grounds other than instinct,” he said—but he is facing the problem of the fiercely partisan politics that consumes D.C.
House Democrats are largely united around keeping the status quo, and Rep. Doris Matsui (D-Calif.) has even released hospital-backed legislation that would codify current regulatory guidance. At least one Democrat has seen the consequences of bucking his party's stance. Rep. Scott Peters (D-Calif.), who joined Rep. Larry Bucshon (R-Ind.) on a transparency measure for hospitals, took a beating in his district with a massive billboard campaign and office protests organized by the AIDS Health Foundation—which is also funding the unicorn metro ad campaign in Washington. 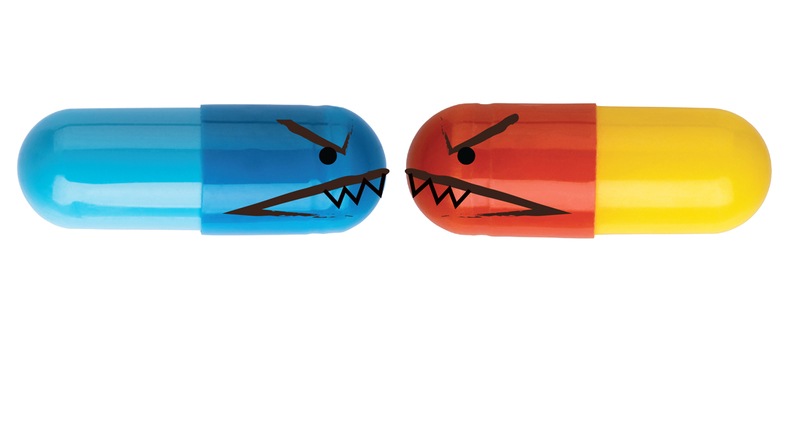 On the other side of the equation, drugmakers face their own strategy quagmire. They are happy with the progress made on the policy front both in the Senate and House committees, particularly since their push began only a year ago. But the Trump administration's role is adding another factor: HHS Secretary Alex Azar is tying 340B changes to its strategy to reduce rising drug prices. The administration surprised pharmaceutical companies with favorable proposals they hadn't even lobbied for. Azar this month pitched House Energy and Commerce GOP lawmakers on a plan to slash 340B money to providers by setting a 20% discount for drugmakers in the program. That's substantially lower than the typical 40% to 60% discount. According to sources in the meeting, the idea received pushback. Collins told Azar that rural, critical-access and other hospitals would have to be carved out. Hospitals will also be keeping an eye on the administration, especially if it bolsters their case in the courts. And the administration's moves, as they raise hackles on Capitol Hill, could also impact policy talks.